This year not only did I attended a meaningful professional development workshop offered by the European Center of the University of Illinois at Urbana-Champaign, but I was actually given the chance to go to Brussels and visit many of the institutions we talked about during the “Food and Energy Security and Sustainability” four-day workshop. How often does a Chicago Public School teacher get to stroll the street of Brussels and Luxembourg? Considering that the resources of the Chicago Public School system are limited, not to mention that my own resources are always quite strained, the opportunities to visit foreign lands are all too infrequent. So away from teachers’ union contract battles, extended-day negotiations, salary increase debates I flew, literally. For a whole week I was able to focus, reflect and plan for the upcoming school year with the invigorating surroundings of a new place, new people and new ideas. I also had a chance to collect tangible teaching aids such as maps, brochures and PowerPoint presentations. We talked a great deal about how Europe is more advanced in green energy and I noticed it as soon as I entered my hotel room at the Thon Hotel in Brussels, formerly Rainbow Hotel before Olav Thon bought the chain. The 4 star-hotel is reducing its ecological footprint by managing water usage with dual-flush toilets, by collecting rain water for non-potable use and by managing and reducing the energy that is generated, in part, by maintaining their own solar panels. It is impossible to turn on a light or to recharge your phone or laptop unless you leave your room key in the slot found near the door. As soon as you leave the room, taking your keycard with you, everything shuts off. Your room key is also very instrumental for using the elevator. Without your room key, you cannot use the elevator and you can only go to your floor or the lobby and other common areas. What a simple yet great tool for energy conservation, which also adds to safety and security. The hotel educates and encourages their guests to reduce water usage even more by giving a five-euro voucher redeemable at the hotel bar or restaurant in exchange for forgoing room cleaning. You could also opt for a Villo pass in lieu of the five-euro voucher. The company is actually J. C. Decaux, the same company whose name you see affixed to bus shelters throughout the city of Chicago. The word “villo” is a contraction of the French word ville meaning city and velo meaning bike. The Villo card allows you to rent a bike at one of the 180 self-serving bike stations located throughout the city. I learned that the construction of these bike stations reduced parking spaces and made some people quite unhappy, while proponents are relishing the reduction of motorized vehicles. Bike sharing stations can be seen in many cities throughout Europe nowadays. Our schedule was pretty tight and I unfortunately did not get to use the Villo. However, for much of the trip, my fellow travelers and I did make great use of another zero greenhouse gas emission mode of transportation—walking. Strolling in the direction of the Parc du Cinquantenaire, past the European Commission building, to get a closer look at the Arc Cinquentenaire, I came across another green mode of transportation—the electric car. I had heard about the Autolib electric car-sharing project in Paris, which was launched last year. 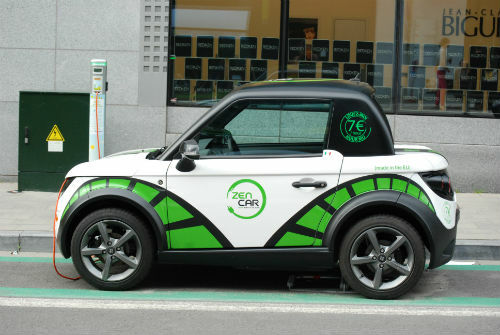 Like Autolib in Paris, Zen Car in Brussels is a green transportation concept that is completely electric, not a hybrid. This green car is there when needed and it makes sense for many of the politicians who come to Brussels and who are commuters from other European countries. Like bicycle lending services found at most train stations throughout Europe, the electric car can be picked up at the airport and dropped off at one of the central locations in town. Since you have to drop the car at the electrical charging station, you do not need to worry about finding a place to park. If you think that gas prices in the United States have skyrocketed lately, Europeans have it worse. They pay an average of 2 Euros per liter and there are 3.7 liters in a gallon (at the time of writing this blog the exchange rate makes the price of gas in Europe over $9 per gallon). It seems to me that the electric car is a right step in reducing oil dependency and perhaps the most significant means of reducing CO2 emissions. Now that I am back in Chicago waiting to hear my fate vis-à–vis the negotiations between the Chicago Teachers Union and Chicago Public Schools, I am very grateful for having been part of the summer study tour to Europe. I wholeheartedly thank Bryan Endres, Matt Rosenstein, Sebnem Ozkan, Kim Rice and Renée Holley for the remarkable work they put into the planning and execution of such an amazing program, bravo! To all my fellow travelers I give many thanks for the camaraderie. Fanny Clonch teaches three different levels of French in the International Baccalaureate program at Curie Metropolitan High School in Chicago, Illinois. This article is one in a series of blog entries authored by teachers who participated in the University of Illinois European Union Center’s 2012 Summer Study Tour: Seeking Sustainable and Secure Connections in Food, Energy, and Governance. The tour to Belgium and Luxembourg was supported by a Getting to Know Europe grant from the European Commission.